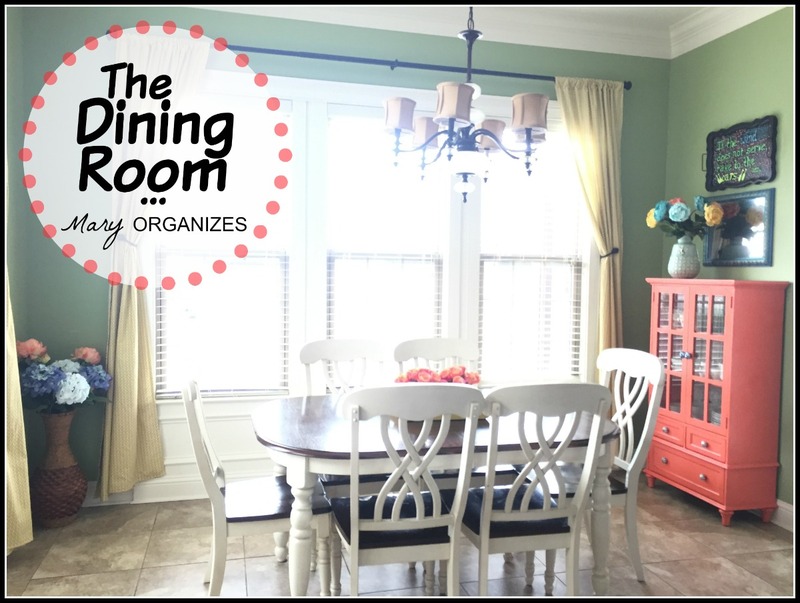 I’m thrilled to show you my dining room! I’ve made a few little changes lately and the effect has been dramatic! It is amazing what a few things can do. One of the things I’ve done is sew new curtains. I sewed these old ones as well and I loved them for a long time, but lately I’ve craved a fresh look. You can see one of the panels is already missing in the before picture. I knew I’d be changing the curtains out soon when I wanted to use that fabric for a different project. Removing it early also confirmed to me that I didn’t want so many panels with the new curtains. 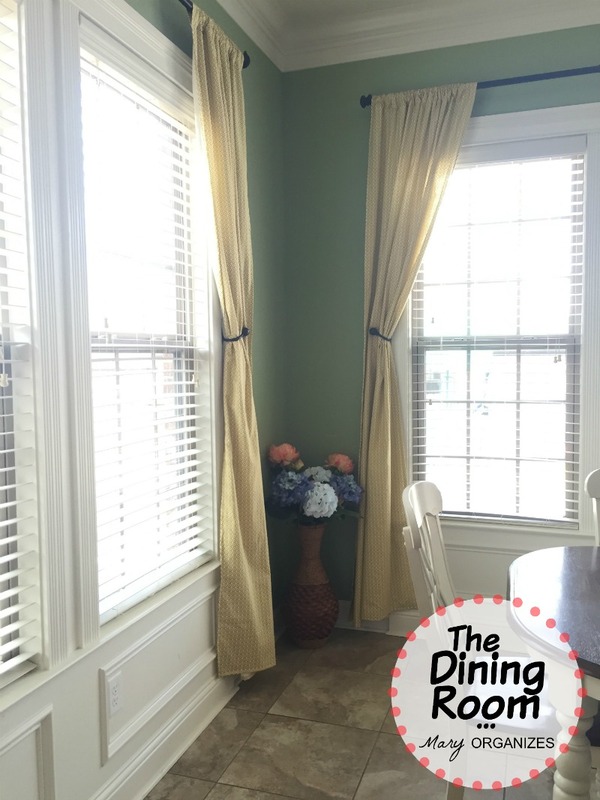 Here are the new curtains! I still wanted yellow, but the new curtains are a darker yellow cotton with a lining of ivory cotton. Instead of ties, we installed pull back hardware. 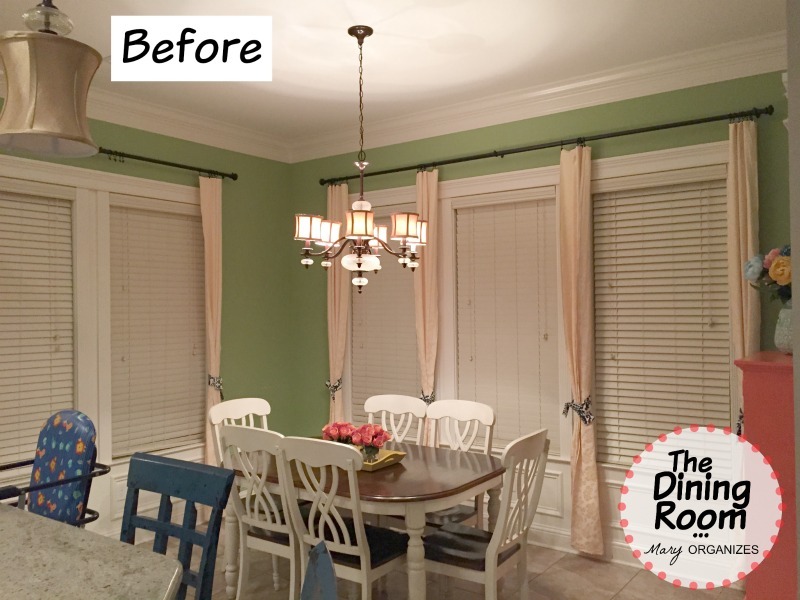 The difference makes the room feel so fresh! I showed you yesterday how I re-did this cabinet. You can see THIS POST to see the before/after transformation of this adorable little dish cabinet. This cabinet just makes my heart sing. I know that sounds silly, but I think it is just the happy colors that make it so beautiful. Beautiful things have an effect on me. I’ve decluttered my old set of dishes because recently my mom mailed me a huge box of my Grandma’s dishes. 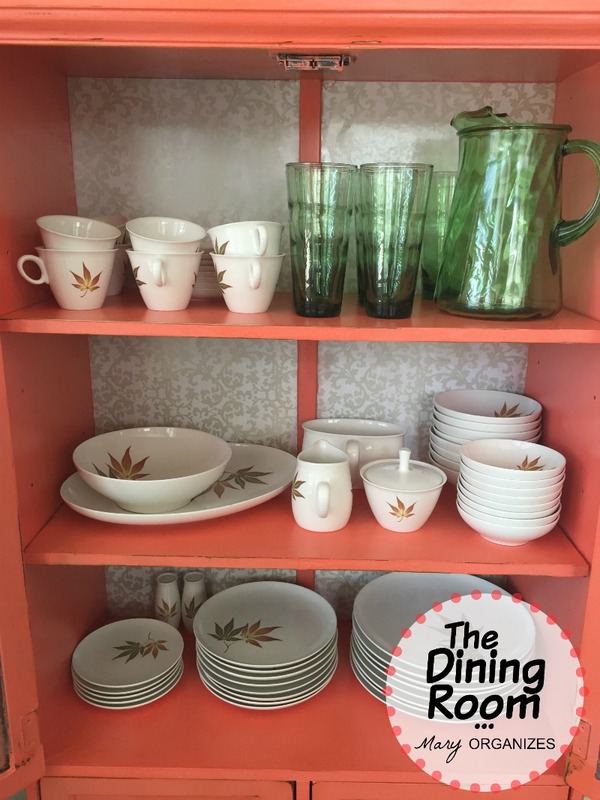 My mom remembers eating off of these when she was a girl. The connection to my family makes these extra special to me and I feel happy to give them a pretty place to be displayed. And those green cups and pitcher – amazing, right?! Now these will be the dishes we will start to use every Sunday and my girls will have memories of using them in their childhood too. These flowers were my first hit of coral into my decor. I had contemplated adding coral for a while, but when I found these at HomeGoods, I knew it was time to go for it. 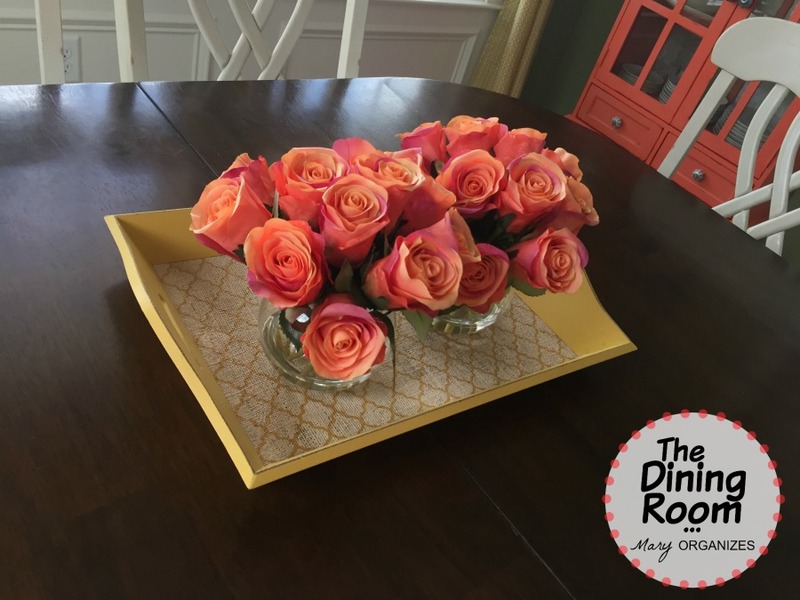 The yellow tray is from Hobby Lobby. And I have a thing for flowers if you haven’t noticed. The vase in the corner is not new, but I pulled it in from my foyer into this new location. The bouquet is new because I wanted to coordinate with the new feel of the room. 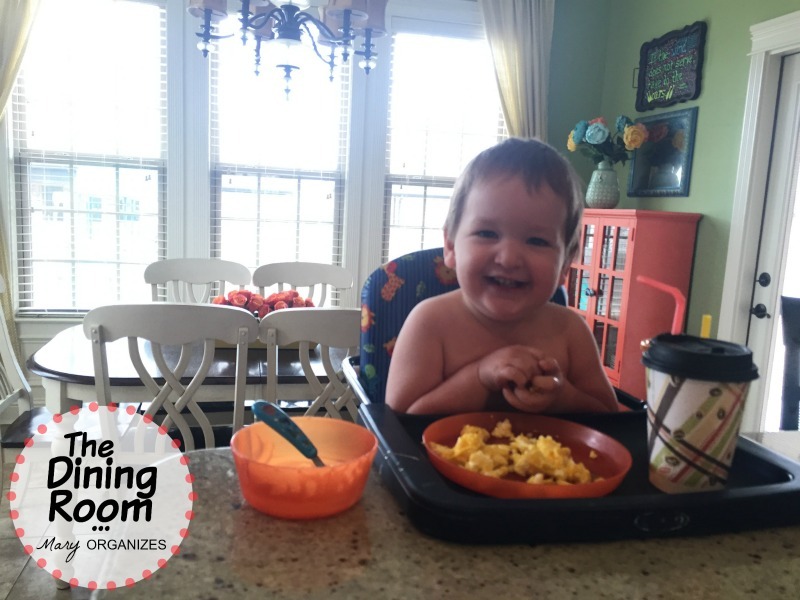 Of all the beautiful things around this place, this little boy’s smile takes the prize. He is as active and curious as they come, but his soft and sweet side melts me. Luckily for me, he is not destructive with our decor and actually appreciates things being in order. He is curious about my flowers and we do a lot of pretend smelling of the fake flowers to satiate his interest. I’ve taught him that flowers outside are for smelling (trying to distract him away from pulling out flowers). I’m tempted to add an actual smell to the fake flowers inside because I don’t want him to think flowers smell like plastic/fabric/wax! He has a booster seat on one of the chairs at the table (hidden in the picture because it is lower than the top of the table). When his sisters are at school, he eats a lot of meals up at the bar while I do things in the kitchen like clean up. He has a thing for sweeping, so he has his own broom. This boy is just the best. 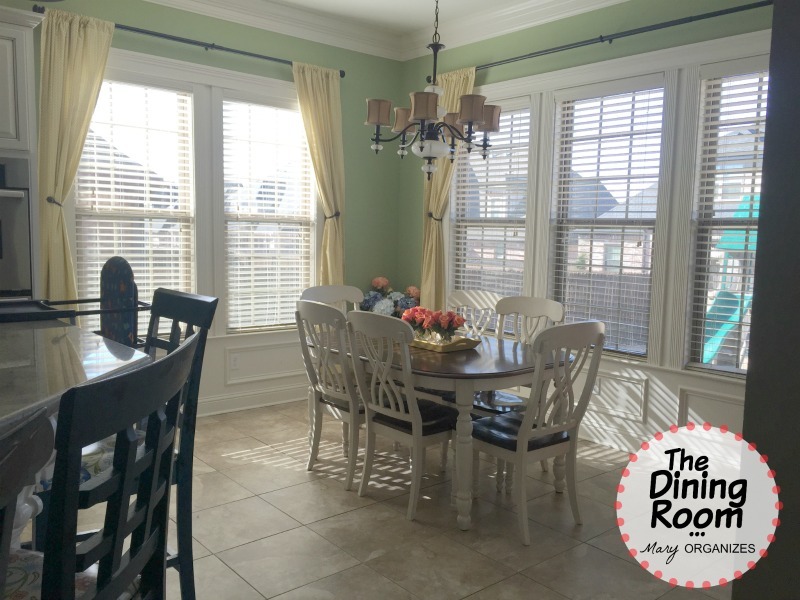 I hope you’ve enjoyed seeing the changes in my dining room. It has been fun to show an update, especially one that thrills me this much!! 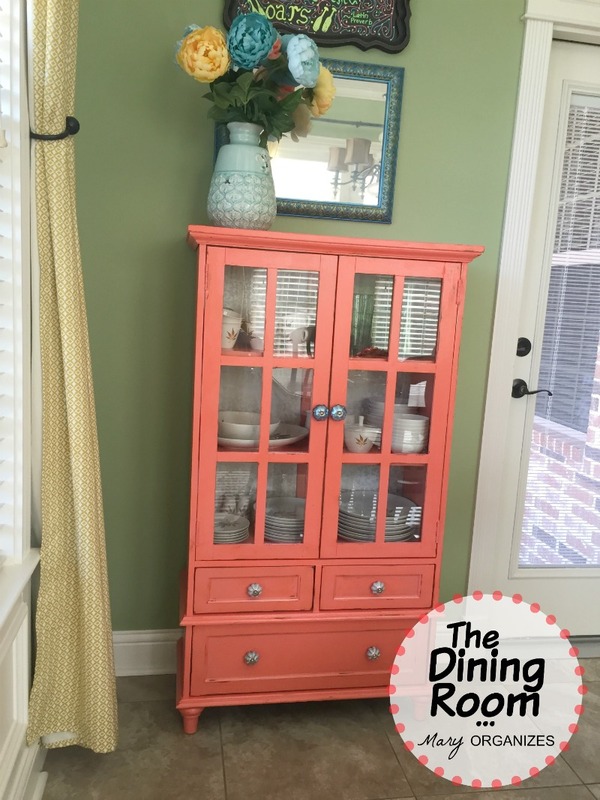 Color makes me happy too, so I understand completely your feelings for your adorable coral cabinet! I also love your grandma’s china — both the pattern (lovely!) and the fact that you are continuing the family tradition of using them. And the curtains, and the boy 🙂 Thanks, Mary — I usually don’t comment but your blog and the facebook page are helping me so much. Thank you so much for taking the time to comment. It really does encourage me! And that boy … he really is the best! Thanks Mom! I was craving a fresh feeling! Love the cabinet Mary. I’m a sucker for coral. My favorite color by far. so pretty, and I must say you have a handsome little helper! I got here from the link on your 4th Annual De-clutter Challenge (week 3). I love the coral color! It’s not something that would work for my husband, but I completely understand how it could make your heart sing. I want to redo my dinning table in similar colors, I’ll be pinning a photo for future reference. It’s a beautiful space. Thank you so much! I was nervous he would really hate it, because he is not the kind of guy to wear a pink tie, if that makes sense. He just seems glad I like it. I work hard to keep his spaces very masculine and he realizes that, so I think he gives me more flexibility in other places.